Resilience can be observed from the aspect of the community, but also from the aspect of the organization. In this study, authors research only organizational aspects of resilience. The goal of these researches is to indicate the significance of the need for improving resilience and determining possibilities for its achievement. Qualitative methods, as well as the extensive literature being a theoretical research frame, have been used for this purpose. Results of our study have shown a tight correlation between globalization level and resilience level, tested for Serbia. In addition, our research indicated that Serbian organizations have a low resilience level. This study has also pointed out that the greatest threats from the business environment for Serbian organizations are big competition in the market and lack of financial funds. Despite, the analysis has simultaneously shown that Serbia in recent years has reached the improvements in the implementation of internal reforms and creation of a more favourable climate for the development of small and medium companies and strengthening of the private sector. Small and Medium-Sized Enterprises Organizational Resilience, Building Resilience, Globalization. H1: As the country is more globally integrated, it is more resistant to negative encouragements from the global business environment (Radovic Markovi? et al., 2017). H2: The most effective ways to enhance resilience is a strong motivation system that drives the individual to learn, grow and adapt to their environment (Petryl?, 2016). The concept of resilience is used to explain why so many endangered countries achieve a relatively high level of GDP (gross domestic product) per capita i.e., how a national economy is able to return to the previous level speaking of the rate of economic growth and to achieve macroeconomic stability and microeconomic market efficiency. However, the economic resilience of a country cannot be achieved unless organizations are also resilient to negative impacts. Therefore, many people see this as two sides of the same coin. Singapore is usually mentioned as an example in literature, as a country highly exposed to external shocks which managed to achieve high rates of economic growth and high GDP per capita. This reality can be explained as the ability of Singapore to build its economic resilience. 1. Technical (The ability of systems to perform during and after disasters). 2. Organizational (The ability of organizations to take actions to reduce disaster impacts). 3. Social (The ability of the communities to lessen negative consequences of disaster). 4. Economic (The capacity of enterprises and economies to absorb economic losses resulting from disaster). Accordingly, literature has been reviewed in order to observe this issue from the position of four above mentioned domains of resilience observation and analysis. The term “resilience” originates from the English language and it can hardly be translated using one word as its meaning is multi-layered. It might be best explained with the term “resistance to negative incentives” and the ability of a country’s economy to recover from external shocks of various natures, i.e. from structural changes caused by global market trends to negative impacts resulting from natural disasters and wars. The term “resilience” was mentioned firstly in 1973 (Holling, 1973) and this work represents a starting point for many studies on the concept of ecological endurance, as well as on many other forms of flexibility. Resilience or resistance of enterprises was defined (Gallopin, 2006) as the ability of an enterprise to cope with changes, adapt to and recover from negative impacts coming from the business environment. He states that, in order to adapt to potential risks, enterprises must have a complex infrastructure management. The key is in the ability of the enterprise to estimate the degree of endangerment, realize mutual relations and interdependence between business activities, information and technologies in the enterprise (Gomes, 2015). Namely, countries having well-developed business plans and action plan in case of risks of natural disasters, as well as programs for evaluation of resilience of an enterprise, have shown higher resilience index than the countries which haven’t had such plans and programs. This concept is also present in interdisciplinary fields dealing with complex systems, such as enterprises, infrastructural systems and ecosystems (Carpenter et al., 2001). In literature, social and organizational resilience are often analysed separately. Despite this, to improve community resilience, it is important for organizations to make the link between resilience and organizational competitiveness and to invest in resilience (Stephenson, 2010). Speaking of the importance of organizational resilience we state that organizational resilience directly contributes to faster and more successful recovery of the community after the crisis or disaster. Building a resilient enterprise should be a strategic initiative that changes the way a company operates and that increases its competitiveness (Sheffi & Rice, 2005). These authors indicate that a company’s resilience can be achieved by reduction of vulnerability and increase of flexibility, which indicates the company’s ability to get back on “the right path” in case of disturbances. Speaking of the organizational resilience of small and medium-sized enterprises, some authors make difference between big and small enterprises (Sullivan & Wilson, 2009). They believe that small and medium-sized enterprises are more endangered than big enterprises i.e., that their resilience to climatic and other disasters is much smaller due to the fact that they usually are not insured against disasters and that they have limited access to loans, while a majority of them doesn’t have business continuity in emergency situations. Also, risk management is not incorporated into their business strategy and plans. Namely, bigger organizations are better organized than small and medium-sized organizations; they have more resources and greater technical knowledge. Furthermore, there are no strategic programs for operationalization of actions plans for small and medium enterprises. Statistical data also indicate that small and medium-sized enterprises are less resilient than big enterprises. However, small and medium-sized enterprises tend to be faster in giving responses, even if their response is not coordinated. The reason for this is the highly simplified structure of decision-making. In addition to the fast response to shocks, entrepreneurs should consider high rate of failure of small enterprises with regard to this and to pay more attention to liquidity, cash flows and seasonal fluctuations (Smith, 2016). Literature on organizations also uses the term “resilience” as a versatile and multidimensional concept (Ponomarov & Holcomb, 2009). In the context of strategic management and changes, resilience is the ability of self-renewal over time through innovations (Reinmoeller & Van Baardwijk, 2005). Furthermore, the building of organizational resilience is connected to employees and management (Mallak, 1999; Patterson et al., 2007; Vogus & Sutcliffe, 2007) who work in the learning organization. According to human resource management (HRM), an organization is resilient if people can respond to changes with minimum stress promptly and efficiently and these are positive possibilities of adaptation which separate competition. In the context of environmental changes/emergency management, resilient organizations are able to adapt to new conditions within which they become better and better (Burnard & Bhamra, 2011), as well as to develop organizational systems which are capable of overcoming turbulent environmental conditions. In this context, increasing the competencies of individuals and their abilities to be able to realize different tasks on daily basis (Salamazdeh et al., 2016), encourages entrepreneurship and SMEs resilience on a wider scale (Radovic Markovic et al., 2017). Resilience implies adaptation of corporate strategy (Beermann, 2011), as well as a solution for organizations having a high level of threat in all aspects of their work environment (Sullivan & Wilson, 2009). As it can be concluded from literature review, the building of resilience is based on the prompt perception of changes in the work environment and early adaptive responses. “This means that winners will be unbridled firms that are responsive to challenges and adroit in both creating opportunities and capturing them” (Radovi?-Markovi?, 2008). Research is based on an overview of references and statistical data (KOF globalization index for the measurement of globalization level, global resilience index), both as own latest studies (2015-2017). This research had an exploratory phase and it is a qualitative study in its nature. Recent studies in Serbia (2016) have shown that Serbian organizations have a low resilience level. For the needs of that study, there were used qualitative methods/direct contact with respondents, in cases where it was not possible to carry out an interview, an electronic questionnaire was used. The sample consisted of 50 respondents from 40 different organizations (information sector, educational institutions, banks and financial institutions). Information sector was present with 46%; education with 38%, while financial was 16%. In sample structure, there participated 40% women and 60% man. About 89% of respondents were aged between 31-40 and in the position of a team leader of an organization. For the interpretation of the data obtained, there were used methods of analysis and synthesis, as well as deduction method. 1. Which external factors have had the most negative impact on the business of their organization? 2. Are there planned potential “internal and external shocks” in the organization? 3. Which are the primary internal factors which have a negative impact on organization’s business? 4. Which are the most efficient methods for encouraging the organization’s resilience? The study has shown that organizations in Serbia have special programs in order to raise the level and resistance to negative incentives. In addition, these questions are not in companies being dealt by educated people in this domain (risk managers, emergency managers). In spite of that, our study has shown that only 12% of organizations stop working in case of a crisis, while 36% continue the work holding on to the standard routines in their business (Radovic Markovi?, 2017). This study has also shown that the greatest threats from the business environment for Serbian organizations are also big competition in the market and lack of financial funds. In case there comes to greater shocks and negative impacts, the first thing that is applied is data protection in IT sector. Approximately 40% of respondents believe that motivation of organizations to continuously learn is the key to raising the resilience level, while 38% of them believe that flexibility of organization is important and the ability of a leader to predict the business risk (p. 38). Therefore, leaders must evaluate in advance the endangerment level of the enterprise, to understand the interdependence between business processes, information and technologies within one organization. In addition, entrepreneurs and managers should deal with high rates of failure of small companies and pay greater attention to their liquidity, money flow and seasonal fluctuations. 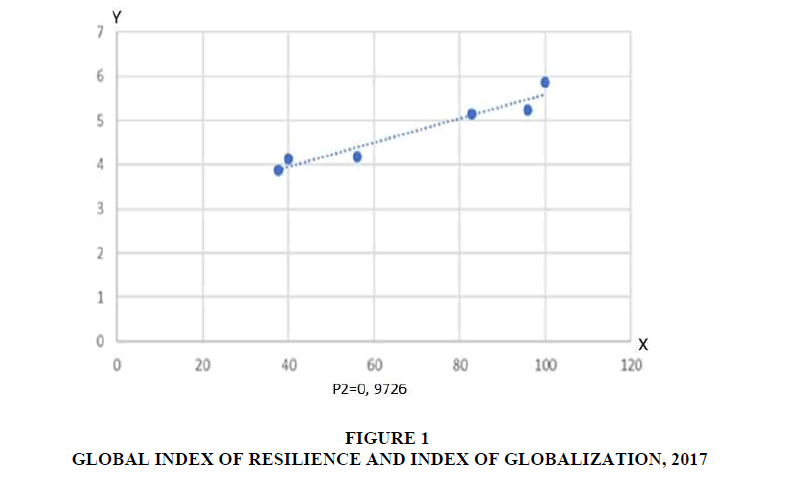 In our research, we also took into account index of globalization and index of resilience. By comparing the index of globalization and a global index of resilience, we can observe high Y dependence ?2=0, 9726 (Figure 1). Namely, as the country is more globally integrated, it is more resistant to negative incentives, which come from the global business environment. It confirmed hypothesis H1. Results of our study have shown a tight correlation between globalization level and resilience level, tested for Serbia and region countries. Therefore, the hypothesis H1 is confirmed. Also, the hypothesis H2 is entirely confirmed, having in mind that only learning organizations can make progress and reach resistance level to all negative encouragements. Those organizations that refuse to learn and improve will definitely one day become not relevant to the industry. According to this statement, we can make use of Nokia as an example. Its president used to say to his colleagues "we didn't do anything wrong, but somehow, we lost". However, they missed out on learning, they missed out on changing and thus they lost the opportunity at hand to make it big. The analysis has simultaneously shown that Serbia in the last couple of years has reached the improvements in the implementation of internal reforms and creation of a more favourable business climate for the development of small and medium companies and strengthening of the business sector. Thus, the development of entrepreneurship in the beginning of 2016 was on the list of priorities of the Government of the Republic of Serbia, which continued throughout 2017 as well. There was also established Development Agency of Serbia (DAS), as the crucial executive institution in charge of implementation of entrepreneurship policy in the country. Serbia should without any doubt continue in the perspective of internal reforms. In addition, having in mind that Serbia is a small country, the only way for it to achieve economic growth and become economically more relevant in the global framework is for it to in greater extent than before internationalize its business activities and start acting in international markets. That implies that Serbia should become a more serious “global player”. However, the manner in which the positioning of small and medium enterprises will be done in the global market will depend on their potentials and limitations-resources available, as well as their ability to react to variable change on the market. Beermann, M. (2011). Linking corporate climate adaptation strategies with resilience thinking. Journal of Cleaner Production, 19(8), 836-842. Burnard, K., & Bhamra, R. (2011). Organisational resilience: Development of a conceptual framework for organizational responses. International Journal of Production Research, 49(18), 5581-5599. Carpenter, S., Walker, B., Anderies, J.M., & Abel, N. (2001). From metaphor to measurement: Resilience of what to what? Ecosystems, 4(8), 765-781. Gallopin, G. (2006). Linkages between vulnerability, resilience and adaptive capacity. Global Environmental Change, 16, 293-303. Gomes, R.S. (2015). Resilience and enterprise architecture In SMEs. Journal of Information System and Technology Management, 12(3). Holling, C.S. (1973). Resilience and stability of ecological systems. Annual Review of Ecology and Systematics, 4, 1-23. Lee, E., & Vivarelli, M. (2006). The social impact of globalization in the developing countries. International Labour Review, 145(3), 167-184. Mallak, L. (1999). Toward a theory of organizational resilience. In Portland International Conference on Technology and Innovation Management. PICMET. Portland, OR: IEEE. Patterson, E.S., Woods, D.D., Cook, R.I., & Render, M.L. (2007). Collaborative cross-checking to enhance resilience. Cognition, Technology & Work, 9(3), 155-162. Petryl?, V. (2016). Does the global competitiveness index demonstrate the resilience of countries to economic crises? Ekonomika, 95(3). Ponomarov, S.Y., & Holcomb, M.C. (2009). Understanding the concept of supply chain resilience. International Journal of Logistics Management, 20(1), 124-143. Radovi?-Markovi?, M . (2008). Managing the organizational change and culture in the age of globalization. Journal of business economics and management, 9(1), 3-11. Radovi?-Markovi?, M., Markovi?, D., Simovi?, V., Medi?, Z., & Zivadinovi?, J. (2017). E-learning as a tool for empowering entrepreneurship. Journal of Women`s Entrepreneurship and Education, (3/4), 65-72. Radovic Markovi?, M., & Vuji?i?, S. (2014). Innovative global companies-some case studies. In the Proceedings, Entrepreneurship: Factors Affecting Small-Scale Business Performance and Development. Radovic Markovi?, M. (2017). Fostering resilience of the enterprises in Serbia. Milan (Ed.). Proceedings Kruševac: Business School (pp. 1-7). Radovic Markovi?, M., Farooq, M.S., & Markovi?, D. (2017). Strengthening the resilience of small and medium-sized enterprises. Management, enterprise and benchmarking in the 21st century. Rajeev, R., & Gupta, S.L. (2016). Factor analysis of impediments for micro, small and medium enterprises in Bihar, International Journal of Entrepreneurship, 20(1), 74-83. Reinmoeller, P., & Van Baardwijk, N. (2005). The link between diversity and resilience. MIT Sloan Management Review, 46(4), 61-65. Salamazdeh, Y., Salamazdeh, A., & Radovic Markovic, M. (2016). International Review, Cultural intelligence and Network Organizations in Society: Case of Tehran Neighborhood Councils, 1(2). Sheffi, Y., & Rice Jr, J.B. (2005). A supply chain view of the resilient enterprise. MIT Sloan Management Review, 47 (1), 41-48. Smith, E. (2016). Risk & Resilience Manager: Building Resilience in SME’s. Oakpark Security,United Kingdom. Stephenson, A. (2010). Benchmarking the resilience of organisations. University of Canterbury. Sull, D. (1999). Why Good Companies Go Bad? Harvard Business Review. Sullivan-Taylor, B., & Wilson, D.C. (2009). Managing the threat of terrorism in British travel and leisure organizations. Organization Studies, 30(2-3), 251-276. Tierney, K. (2003). Conceptualising and Measuring Organizational and Community Resilience: Lessons from the Emergency Response Following the September 11, 2001 Attack on the World Trade Center, Preliminary paper 329. Newark: University of Delaware. Vogus, T.J., & Sutcliffe, K.M. (2007). Organizational resilience: towards a theory and research age da. IEEE Conference on Systems, Man and Cyb.